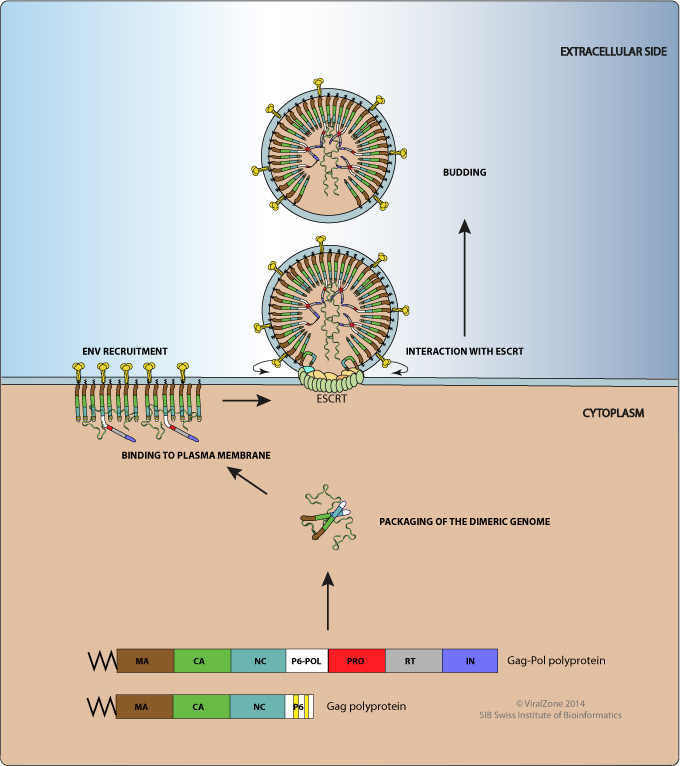 Mediates (with pr160GagPol) the essential events in virion assembly, including binding to the plasma membrane, making the protein-protein interactions necessary to create spherical particles, recruiting the viral Env proteins, and packaging the genomic RNA via direct interactions with the RNA packaging sequence (Psi) . Involved in virion ESCRT-dependent budding through two distinct late assembly domains (L-domains) located in the P6 domain. Plays a role in incorporation of Vpr into virus particles . Recognizes the packaging sequence (Psi) and allows gRNA dimerization and packaging. Also binds the Bro1 domain of Alix, STAU1, ABCE1, DHX9, EAP30 and interacts with the plasma membrane during the process of virion assembly. Interacts with the cellular ESCRT system for budding. Interacts with the plasma through the phosphatidyl-inositol-4,5-bisphosphate binding domain and the myristoyl moiety. Interacts with Env gp41 C-terminus. Interacts with host AP-2 and AP-3 targeting the polyprotein to multivesicular bodies.